The Orion Nebula (also known as Messier 42, M42, or NGC 1976) is a diffuse nebula situated in the Milky Way, being south of Orion's Belt in the constellation of Orion. [b] It is one of the brightest nebulae, and is visible to the naked eye in the night sky. M42 is located at a distance of 1,344 ± 20 light years and is the closest region of massive star formation to Earth. The M42 nebula is estimated to be 24 light years across. It has a mass of about 2,000 times that of the Sun. Older texts frequently refer to the Orion Nebula as the Great Nebula in Orion or the Great Orion Nebula. The Orion Nebula is one of the most scrutinized and photographed objects in the night sky, and is among the most intensely studied celestial features. The nebula has revealed much about the process of how stars and planetary systems are formed from collapsing clouds of gas and dust. Astronomers have directly observed protoplanetary disks, brown dwarfs, intense and turbulent motions of the gas, and the photo-ionizing effects of massive nearby stars in the nebula. The Orion Nebula contains a very young open cluster, known as the Trapezium due to the asterism of its primary four stars. Two of these can be resolved into their component binary systems on nights with good seeing, giving a total of six stars. The stars of the Trapezium, along with many other stars, are still in their early years. The Trapezium is a component of the much larger Orion Nebula Cluster, an association of about 2,800 stars within a diameter of 20 light years. Two million years ago this cluster may have been the home of the runaway stars AE Aurigae, 53 Arietis, and Mu Columbae, which are currently moving away from the nebula at speeds greater than 100 km/s. Observers have long noted a distinctive greenish tint to the nebula, in addition to regions of red and of blue-violet. The red hue is a result of the Hα recombination line radiation at a wavelength of 656.3 nm. The blue-violet coloration is the reflected radiation from the massive O-class stars at the core of the nebula. The green hue was a puzzle for astronomers in the early part of the 20th century because none of the known spectral lines at that time could explain it. There was some speculation that the lines were caused by a new element, and the name nebulium was coined for this mysterious material. With better understanding of atomic physics, however, it was later determined that the green spectrum was caused by a low-probability electron transition in doubly ionized oxygen, a so-called "forbidden transition". This radiation was all but impossible to reproduce in the laboratory at the time, because it depended on the quiescent and nearly collision-free environment found in the high vacuum of deep space. There has been speculation that the Mayans of Central America may have described the nebula within their "Three Hearthstones" creation myth; if so, the three would correspond to two stars at the base of Orion, Rigel and Saiph, and another, Alnitak at the tip of the "belt" of the imagined hunter, the vertices of a nearly perfect equilateral triangle[vague] with Orion's Sword (including the Orion Nebula) in the middle of the triangle[vague] seen as the smudge of smoke from copal incense in a modern myth, or, in (the translation it suggests of) an ancient one, the literal or figurative embers of a fiery creation. Neither Ptolemy's Almagest nor Al Sufi's Book of Fixed Stars noted this nebula, even though they both listed patches of nebulosity elsewhere in the night sky; nor did Galileo mention it, even though he also made telescopic observations surrounding it in 1610 and 1617. This has led to some speculation that a flare-up of the illuminating stars may have increased the brightness of the nebula. The first discovery of the diffuse nebulous nature of the Orion Nebula is generally credited to French astronomer Nicolas-Claude Fabri de Peiresc, on November 26, 1610 when he made a record of observing it with a refracting telescope purchased by his patron Guillaume du Vair. "one sees how in like manner some stars are compressed into a very narrow space and how round about and between the stars a white light like that of a white cloud is poured out"
The nebula was independently "discovered" (though visible to the naked eye) by several other prominent astronomers in the following years, including by Giovanni Battista Hodierna (whose sketch was the first published in De systemate orbis cometici, deque admirandis coeli characteribus). Charles Messier observed the nebula on March 4, 1769, and he also noted three of the stars in Trapezium. Messier published the first edition of his catalog of deep sky objects in 1774 (completed in 1771). As the Orion Nebula was the 42nd object in his list, it became identified as M42. Henry Draper's 1880 photograph of the Orion Nebula, the first ever taken. One of Andrew Ainslie Common's 1883 photographs of the Orion Nebula, the first to show that a long exposure could record new stars and nebulae invisible to the human eye. In 1865 English amateur astronomer William Huggins used his visual spectroscopy method to examine the nebula showing it, like other nebulae he had examined, was made up of "luminous gas". 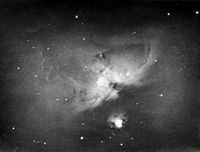 On September 30, 1880 Henry Draper used the new dry plate photographic process with an 11-inch (28 cm) refracting telescope to make a 51-minute exposure of the Orion Nebula, the first instance of astrophotography of a nebula in history. 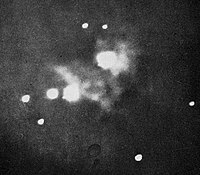 Another set of photographs of the nebula in 1883 saw a breakthrough in astronomical photography when amateur astronomer Andrew Ainslie Common used the dry plate process to record several images in exposures up to 60 minutes with a 36-inch (91 cm) reflecting telescope that he constructed in the backyard of his home in Ealing, outside London. These images for the first time showed stars and nebula detail too faint to be seen by the human eye. In 1902, Vogel and Eberhard discovered differing velocities within the nebula and by 1914 astronomers at Marseilles had used the interferometer to detect rotation and irregular motions. Campbell and Moore confirmed these results using the spectrograph, demonstrating turbulence within the nebula. In 1931, Robert J. Trumpler noted that the fainter stars near the Trapezium formed a cluster, and he was the first to name them the Trapezium cluster. Based on their magnitudes and spectral types, he derived a distance estimate of 1,800 light years. This was three times farther than the commonly accepted distance estimate of the period but was much closer to the modern value. In 1993, the Hubble Space Telescope first observed the Orion Nebula. Since then, the nebula has been a frequent target for HST studies. The images have been used to build a detailed model of the nebula in three dimensions. Protoplanetary disks have been observed around most of the newly formed stars in the nebula, and the destructive effects of high levels of ultraviolet energy from the most massive stars have been studied. In 2005, the Advanced Camera for Surveys instrument of the Hubble Space Telescope finished capturing the most detailed image of the nebula yet taken. The image was taken through 104 orbits of the telescope, capturing over 3,000 stars down to the 23rd magnitude, including infant brown dwarfs and possible brown dwarf binary stars. A year later, scientists working with the HST announced the first ever masses of a pair of eclipsing binary brown dwarfs, 2MASS J05352184–0546085. The pair are located in the Orion Nebula and have approximate masses of 0.054 M☉ and 0.034 M☉ respectively, with an orbital period of 9.8 days. Surprisingly, the more massive of the two also turned out to be the less luminous. Optical images reveal clouds of gas and dust in the Orion Nebula; an infrared image (right) reveals the new stars shining within. The entirety of the Orion Nebula extends across a 1° region of the sky, and includes neutral clouds of gas and dust, associations of stars, ionized volumes of gas, and reflection nebulae. The Nebula is part of a much larger nebula that is known as the Orion Molecular Cloud Complex. The Orion Molecular Cloud Complex extends throughout the constellation of Orion and includes Barnard's Loop, the Horsehead Nebula, M43, M78, and the Flame Nebula. Stars are forming throughout the entire Cloud Complex, but most of the young stars are concentrated in dense clusters like the one illuminating the Orion Nebula. Orion A molecular cloud from VISTA reveals many young stars and other objects. The current astronomical model for the nebula consists of an ionized (H II) region, roughly centered on Theta1 Orionis C, which lies on the side of an elongated molecular cloud in a cavity formed by the massive young stars. (Theta1 Orionis C emits 3-4 times as much photoionizing light as the next brightest star, Theta2 Orionis A.) The H II region has a temperature ranging up to 10,000 K, but this temperature falls dramatically near the edge of the nebula. The nebulous emission comes primarily from photoionized gas on the back surface of the cavity. The H II region is surrounded by an irregular, concave bay of more neutral, high-density cloud, with clumps of neutral gas lying outside the bay area. This in turn lies on the perimeter of the Orion Molecular Cloud. The gas in the molecular cloud displays a range of velocities and turbulence, particularly around the core region. Relative movements are up to 10 km/s (22,000 mi/h), with local variations of up to 50 km/s and possibly more. Observers have given names to various features in the Orion Nebula. The dark lane that extends from the north toward the bright region is called the "Fish's Mouth". The illuminated regions to both sides are called the "Wings". Other features include "The Sword", "The Thrust", and "The Sail". The Orion Nebula is an example of a stellar nursery where new stars are being born. Observations of the nebula have revealed approximately 700 stars in various stages of formation within the nebula. 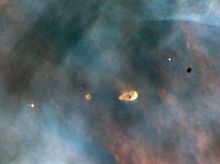 Recent observations with the Hubble Space Telescope have yielded the major discovery of protoplanetary disks within the Orion Nebula, which have been dubbed proplyds. HST has revealed more than 150 of these within the nebula, and they are considered to be systems in the earliest stages of solar system formation. The sheer numbers of them have been used as evidence that the formation of star systems is fairly common in the universe. Stars form when clumps of hydrogen and other gases in an H II region contract under their own gravity. As the gas collapses, the central clump grows stronger and the gas heats to extreme temperatures by converting gravitational potential energy to thermal energy. If the temperature gets high enough, nuclear fusion will ignite and form a protostar. The protostar is 'born' when it begins to emit enough radiative energy to balance out its gravity and halt gravitational collapse. Typically, a cloud of material remains a substantial distance from the star before the fusion reaction ignites. This remnant cloud is the protostar's protoplanetary disk, where planets may form. Recent infrared observations show that dust grains in these protoplanetary disks are growing, beginning on the path towards forming planetesimals. Once formed, the stars within the nebula emit a stream of charged particles known as a stellar wind. Massive stars and young stars have much stronger stellar winds than the Sun. The wind forms shock waves or hydrodynamical instabilities when it encounters the gas in the nebula, which then shapes the gas clouds. The shock waves from stellar wind also play a large part in stellar formation by compacting the gas clouds, creating density inhomogeneities that lead to gravitational collapse of the cloud. View of the ripples (Kelvin–Helmholtz instability) formed by the action of stellar winds on the cloud. Bow shocks are stationary and are formed when two particle streams collide with each other. They are present near the hottest stars in the nebula where the stellar wind speed is estimated to be thousands of kilometers per second and in the outer parts of the nebula where the speeds are tens of kilometers per second. Bow shocks can also form at the front end of stellar jets when the jet hits interstellar particles. Jet-driven shocks are formed from jets of material sprouting off newborn T Tauri stars. These narrow streams are traveling at hundreds of kilometers per second, and become shocks when they encounter relatively stationary gases. Warped shocks appear bow-like to an observer. They are produced when a jet-driven shock encounters gas moving in a cross-current. The interaction of the stellar wind with the surrounding cloud also forms "waves" which are believed to be due to the hydrodynamical Kelvin-Helmholtz instability. The dynamic gas motions in M42 are complex, but are trending out through the opening in the bay and toward the Earth. The large neutral area behind the ionized region is currently contracting under its own gravity. There are also supersonic "bullets" of gas piercing the hydrogen clouds of the Orion Nebula. Each bullet is ten times the diameter of Pluto's orbit and tipped with iron atoms glowing in the infra-red. They were probably formed one thousand years ago from an unknown violent event. Panoramic image of the center of the nebula, taken by the Hubble Telescope. This view is about 2.5 light years across. The Trapezium is at center left. Whether due to collisions with a spiral arm, or through the shock wave emitted from supernovae, the atoms are precipitated into heavier molecules and the result is a molecular cloud. This presages the formation of stars within the cloud, usually thought to be within a period of 10–30 million years, as regions pass the Jeans mass and the destabilized volumes collapse into disks. The disk concentrates at the core to form a star, which may be surrounded by a protoplanetary disk. This is the current stage of evolution of the nebula, with additional stars still forming from the collapsing molecular cloud. The youngest and brightest stars we now see in the Orion Nebula are thought to be less than 300,000 years old, and the brightest may be only 10,000 years in age. Some of these collapsing stars can be particularly massive, and can emit large quantities of ionizing ultraviolet radiation. An example of this is seen with the Trapezium cluster. Over time the ultraviolet light from the massive stars at the center of the nebula will push away the surrounding gas and dust in a process called photo evaporation. This process is responsible for creating the interior cavity of the nebula, allowing the stars at the core to be viewed from Earth. The largest of these stars have short life spans and will evolve to become supernovae. Within about 100,000 years, most of the gas and dust will be ejected. The remains will form a young open cluster, a cluster of bright, young stars surrounded by wispy filaments from the former cloud. Web of filaments in the Orion Nebula. An APEX view of star formation in the Orion Nebula. Orion Nebula was captured using the Wide Field Imager camera on the MPG/ESO 2.2-metre telescope. RGB image of the Orion Nebula (M42) and Running Man Nebula (Sh2-279) taken with a 5" apochromatic refractor and a DSLR. Orion Nebula Complex including M42, M43, Running Man Nebula (NGC 1973, 1975, and 1977) and much of the surrounding nebulosity. Panoramic image of the Orion Nebula, taken by Ioannidis Panos with an 8 Inch Newtonian telescope and a Nikon D70 camera. Infant stars, image from NASA's Spitzer Space Telescope. The Orion Nebula imaged with the 2.2m ESO/MPG telescope. The central part of the Orion Nebula. This wide-field view of the Orion Nebula (Messier 42), was taken with the VISTA infrared survey telescope at ESO's Paranal Observatory in Chile. The Orion Nebula's biggest stars. An infrared image showing fledgling stars located in the Orion Nebula. Core detail of the nebula with all the stars identified. A shot of the core details of the Orion Nebula. H-alpha image of the nebula with amateur telescope. ^ From temperate zones in the Northern Hemisphere, the nebula appears below the Belt of Orion; from temperate zones in the Southern Hemisphere the nebula appears above the Belt. ^ C. Robert O'Dell commented about this Wikipedia article, "The only egregious error is the last sentence in the Stellar Formation section. It should actually read 'Even though most planetary disks can form planets, observations show that intense stellar radiation should have destroyed any proplyds that formed near the Trapezium group, if the group is as old as the low mass stars in the cluster. Since proplyds are found very close to the Trapezium group, it can be argued that those stars are much younger than the rest of the cluster members.'" ^ a b "NGC 7538". SIMBAD. Centre de données astronomiques de Strasbourg. Retrieved October 20, 2006. ^ Gater, Will; Vamplew, Anton (2010). The Practical Astronomer (1st American ed.). London: DK Pub. p. 242. ISBN 978-0-7566-7324-6. ^ a b Reid, M. J.; et al. (2009). "Trigonometric Parallaxes of Massive Star Forming Regions: VI. Galactic Structure, Fundamental Parameters and Non-Circular Motions". Astrophysical Journal. 700 (1): 137–148. arXiv:0902.3913. Bibcode:2009ApJ...700..137R. doi:10.1088/0004-637X/700/1/137. ^ "NGC 1976 = M42". SEDS.org. Retrieved December 13, 2009. ^ Revised NGC Data for NGC 1976 per Wolfgang Steinicke's Revised New General Catalogue and Index Catalogue. ^ Hirota, Tomoya; et al. (2007). "Distance to Orion KL Measured with VERA". Publications of the Astronomical Society of Japan. 59 (5): 897–903. arXiv:0705.3792. Bibcode:2007PASJ...59..897H. doi:10.1093/pasj/59.5.897. Ripley, George; Dana, Charles A., eds. (1879). "Nebula" . The American Cyclopædia. ^ a b Press release, "Astronomers Spot The Great Orion Nebula's Successor Archived 2006-02-18 at the Wayback Machine", Harvard-Smithsonian Center for Astrophysics, 2006. ^ Clark, Roger (March 28, 2004). "Surface Brightness of Deep Sky Objects". Retrieved June 29, 2013. . The conversion to nits is based on 0 magnitude being 2.08 microlux. ^ Hillenbrand, L. A.; Hartmann, L. W. (1998). "Preliminary Study of the Orion Nebula Cluster Structure and Dynamics". Astrophysical Journal. 492 (2): 540–553. Bibcode:1998ApJ...492..540H. doi:10.1086/305076. ^ Blaauw, A.; et al. (1954). "The Space Motions of AE Aurigae and μ Columbae with Respect to the Orion Nebula". Astrophysical Journal. 119: 625. Bibcode:1954ApJ...119..625B. doi:10.1086/145866. ^ Bowen, Ira Sprague (1927). "The Origin of the Nebulium Spectrum". Nature. 120 (3022): 473. Bibcode:1927Natur.120..473B. doi:10.1038/120473a0. ^ Carrasco, David, ed. (2001). The Oxford Encyclopedia of Mesoamerican cultures : the civilizations of Mexico and Central America. Oxford [u.a. ]: Oxford Univ. Press. p. 165. ISBN 978-0-19-514257-0. ^ Krupp, Edward (February 1999). "Igniting the Hearth". Sky & Telescope: 94. Archived from the original on December 11, 2007. Retrieved October 19, 2006. ^ a b c James, Andrew (June 27, 2012). "The Great Orion Nebula: M42 & M43". Southern Astronomical Delights. Retrieved June 27, 2012. ^ Tibor Herczeg, Norman (January 22, 1999). "The Orion Nebula: A chapter of early nebular studies". Acta Historica Astronomiae. 3: 246. Bibcode:1998AcHA....3..246H. Retrieved October 27, 2006. ^ "The Discoverer of the Great Nebula in Orion". Scientific American. 114: 615. June 10, 1916. ^ Lynn, W. (June 1887). "First Discovery of The Great Nebula in Orion, The Observatory, Vol 10 p 232-233". The Observatory. 10: 232. Bibcode:1887Obs....10R.232L. ^ a b Schreiber, John (1904). "Jesuit Astronomy". Popular Astronomy. 12: 101. ^ Harrison, Thomas G. (1984). "The Orion Nebula: Where in History is it?". Quarterly Journal of the Royal Astronomical Society. 25: 71. Bibcode:1984QJRAS..25...65H. ^ Frommert, H.; Kronberg, C. (August 25, 2007). "Hodierna's Deep Sky Observations". SEDS. Retrieved August 11, 2015. ^ Messier, Charles (1774). "Catalogue des Nébuleuses & des amas d'Étoiles, que l'on découvre parmi les Étoiles fixes sur l'horizon de Paris; observées à l'Observatoire de la Marine, avec différens instruments". Mémoires de l'Académie Royale des Sciences. ^ Becker, Barbara J. (1993). "Chapter 2—Part 3: Unlocking the "Unknown Mystery of the True Nature of the Heavenly Bodies"". Eclecticism, Opportunism, and the Evolution of a New Research Agenda: William and Margaret Huggins and the Origins of Astrophysics (PhD). Retrieved March 4, 2016. ^ Hearnshaw, J.B. (1996). The Measurement of Starlight: Two Centuries Of Astronomical Photometry. New York: Cambridge University Press. p. 122. ISBN 9780521403931. Retrieved March 4, 2016. ^ Campbell, W. W.; et al. (1917). "On the Radial Velocities of the Orion Nebula". Publications of the Astronomical Society of the Pacific. 29 (169): 143. Bibcode:1917PASP...29..143C. doi:10.1086/122612. ^ Trumpler, Robert Julius (1931). "The Distance of the Orion Nebula". Publications of the Astronomical Society of the Pacific. 43 (254): 255. Bibcode:1931PASP...43..255T. doi:10.1086/124134. ^ a b David F. Salisbury, 2001, "Latest investigations of Orion Nebula reduce odds of planet formation Archived 2006-05-27 at the Wayback Machine". ^ Robberto, M.; et al. (2005). "An overview of the HST Treasury Program on the Orion Nebula". Bulletin of the American Astronomical Society. 37: 1404. Bibcode:2005AAS...20714601R. See also see the NASA press release. ^ K.G. Stassun; et al. (2006). "Discovery of two young brown dwarfs in an eclipsing binary system". Nature. 440 (7082): 311–314. Bibcode:2006Natur.440..311S. doi:10.1038/nature04570. PMID 16541067. ^ Megeath, S. T.; et al. (2012). "The Spitzer Space Telescope Survey of the Orion A and B Molecular Clouds. I. A Census of Dusty Young Stellar Objects and a Study of Their Mid-infrared Variability". Astronomical Journal. 144 (6): 192. arXiv:1209.3826. Bibcode:2012AJ....144..192M. doi:10.1088/0004-6256/144/6/192. ^ Kuhn, M. A.; et al. (2015). "The Spatial Structure of Young Stellar Clusters. II. Total Young Stellar Populations". Astrophysical Journal. 802 (1): 60. arXiv:1501.05300. Bibcode:2015ApJ...802...60K. doi:10.1088/0004-637X/802/1/60. ^ "Hidden Secrets of Orion's Clouds – VISTA survey gives most detailed view of Orion A molecular cloud in the near-infrared". www.eso.org. Retrieved January 5, 2017. ^ O'Dell, C. R. (2001). "Structure of the Orion Nebula". Publications of the Astronomical Society of the Pacific. 113 (779): 29–40. Bibcode:2001PASP..113...29O. doi:10.1086/317982. ^ a b c Balick, B.; et al. (1974). "The structure of the Orion nebula". Publications of the Astronomical Society of the Pacific. 86 (513): 616. Bibcode:1974PASP...86..616B. doi:10.1086/129654. ^ O'Dell, C. R.; et al. (2009). "The Three-Dimensional Dynamic Structure of the Inner Orion Nebula". Astronomical Journal. 137 (779): 367–382. arXiv:0810.4375. Bibcode:2001PASP..113...29O. doi:10.1086/317982. ^ "M-42", Students for the Exploration and Development of Space, April 12, 2006. ^ McCaughrean, Mark J.; et al. (1996). "Direct Imaging of Circumstellar Disks in the Orion Nebula". Astronomical Journal. 111: 1977. Bibcode:1996AJ....111.1977M. doi:10.1086/117934. ^ "Gemini's Laser Vision Reveals Striking New Details in Orion Nebula". Gemini Observatory. March 22, 2007. Retrieved June 1, 2010. ^ "Detail of the Orion Nebula", HST image and text. ^ Kroupa, P., Aarseth, S.J., Hurley, J. 2001, MNRAS, 321, 699, "The formation of a bound star cluster: from the Orion nebula cluster to the Pleiades"
^ "ALMA Reveals Inner Web of Stellar Nursery". www.eso.org. Retrieved March 19, 2018. Wikimedia Commons has media related to Orion Nebula. Messier 42, SEDS Messier pages and specifically NGC 1976. Remarkable new views captured of Orion Nebula, SpaceFlight Now, 2001. Gray, Meghan; et al. "M42 – Orion Nebula". Deep Sky Videos. Brady Haran.